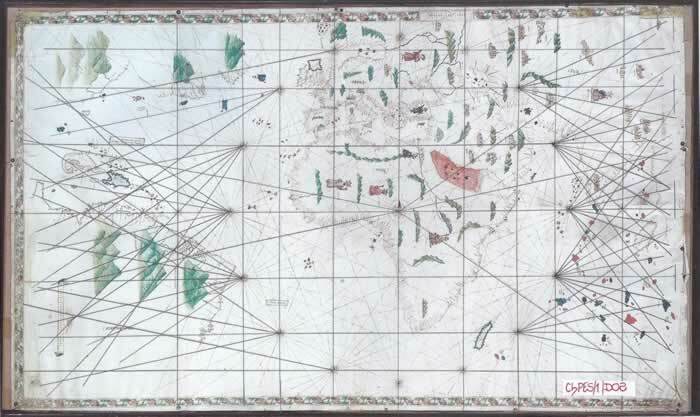 This world map is held in the Biblioteca Oliveriana, Pesaro and is a superb presentation of the data available just after the start of the 16th century. 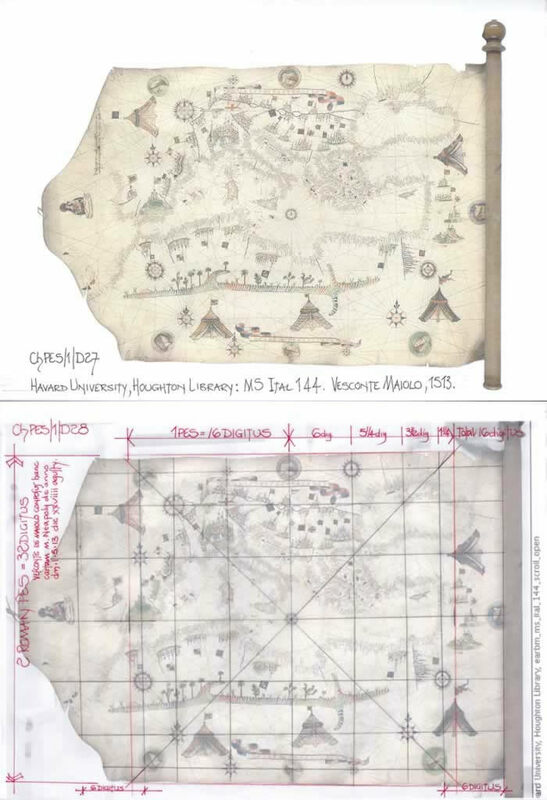 It is drawn on a parchment measuring 1220 x 2060mm and is overall 1140 x 1970mm. 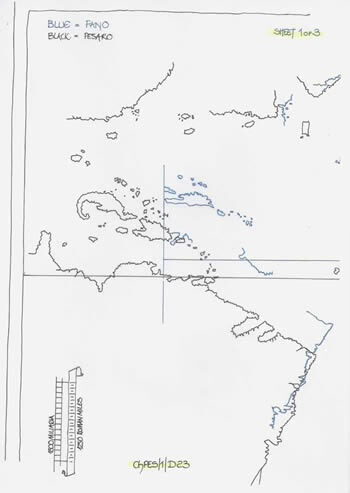 The western section illustrates the Spanish and Portuguese exploration of the West Indies and South America as well as the multi country explorations of the NE Coast of Canada. That chart section as described covers approximately one third of the chart area. The central section comprising Europe and Africa covers c45% of the chart area with the India/Malaysia section occupying c22%. And there-in is the presentational problem with South America etc occupying the same chart width as the African continent which spans some 68.5 degrees longitude, whilst the Indian/Malaysian section from the R. Indus to the R. Ganges is 24 degrees longitude. The South American section as drawn may be considered extending from 35W to 85W, twice the longitude of the Indian Section but drawn three times as large and is thus also c135% larger than Africa. There is a centre line horizontally which is the wind rose centre line and it is set quite similarly to the Waldseemuller1507 Equator across Africa ,which is there-on some 20 degrees north of actuality, where-as here it is 10 degrees north, but if corrected then the north coastline of South America would be correct at 10N. Interestingly it is probably the King-Hamy chart (or a similarly presented chart) which causes this problem of wrong latitudes, as will be discussed in a later paper, and all because of its double Equatorial line. It is therefore obvious distance measures are totally awry and must be investigated. A simple visual inspection of the chart indicated that contrary to other researchers opinions it is not missing a section in the East, but in all probability all that is missing is a sliver of parchment containing just the bordure and the fixing/holding section of parchment to enable its storage or hanging on wall hooks via a batten roll common for many charts. The visual proof is so very simple; study the western edge of the chart where the bordure has been drawn completely and look at the wind rose graticule and wind direction lines. Out of 30 lines approaching this bordure, as indicated, 4 graticule lines touch the bordure and 5 wind lines leaving the other 21 lines to finish in limbo, short of the bordure. That is unseen on other charts and probably indicates that the bordure was not drawn or even positioned at this juncture. Now transfer attention to the east and it is a replica of the west. On the diagram the probable bordure line position has been indicated using the shadow line and marks found on the parchment itself. 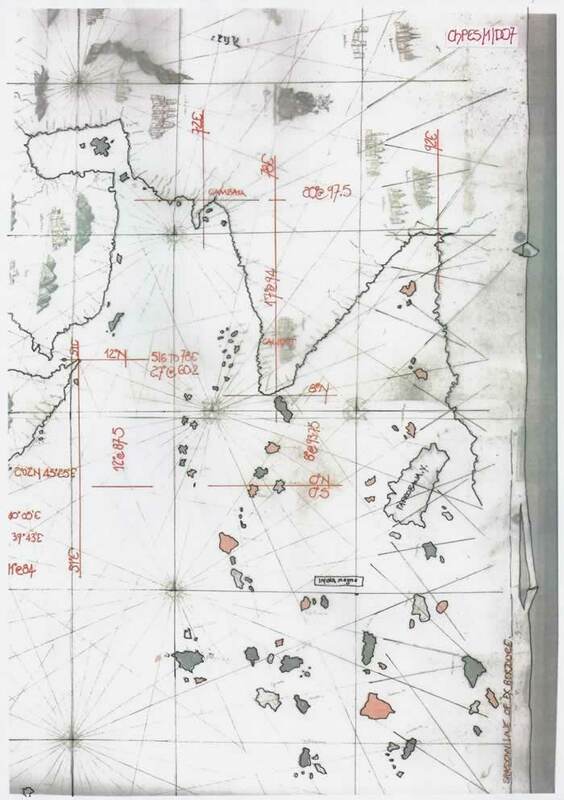 This positioning allows for the highly coloured islands on the chart to be seen, and thus the actual chart mainland does not fill the whole space available and thus both east and west sides are the same with their lines stopping well short of the bordure. Thus the parchment was produced without the knowledge of the maps overall longitude and the wind rose was drawn as if the bordures were to be closer to the centre to match the wind line finishing point, when instead the draughtsman has positioned them to maximise the overall length no doubt as bigger was better and more easily saleable! The first task in any such investigation is to ascertain the denomination of the scale bars which can be simply carried out by measuring the latitudinal distance from Cape St Vincent, 37N, to Cape Finisterre, 43N, on the west coast of Portugal/Iberia and then the longitudinal distance from Cape St Vincent, 9W, to Gulf of Issus, 36E, an overall 45 degrees as can be seen on Diagram ChPES/1/D05. 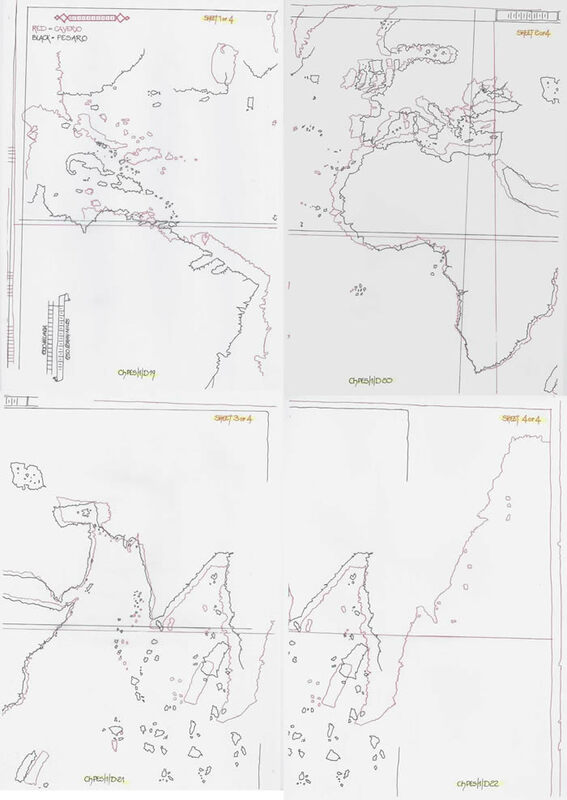 The results produced a major surprise as it indicated the first distance, 37N/43N to be 6 degrees of 75 units, which on Portolan Charts as previously examined indicated a mis-measurement via the scale bar of Miliaria but in fact they were Roman Miles of 75 per degree. But, when the second distance of 45 degrees was measured the answer was 2700 units, which is of course 45 degrees of 60 units. That is the perfect proportion for the latitude/longitude as proscribed by Claudius Ptolemy with a 5:4 ratio. Thus the distance measures are in fact Roman Miles and the Scale Bars are Roman Mile units. The main scale bar in the SW corner indicates 1250 Roman Miles, which is in itself a curiosity as normally the subdivisions would be equal, but in this case we have a half division. However, 1250 Roman Miles equals 16.67 degrees at 75 per degree and by converting that measurement to Miliaria the scale bar can be redrawn as 16.67 degrees of 90 Miliaria which is a total of 1500 Miliaria, and has been indicated upon diagram ChPES/1/D04 to explain these findings. Confirmation of this measurement and the knowledge of the draughtsman are given with the short scale bar set in the northern bordure. It has 7 x 100 + 1 x 50 sections, total 750 Roman Miles which is the equivalent of 10 degrees latitude, but it can also be redrawn to give 10 x 90 Miliaria, totalling 900 Miliaria and thus probably 9 x 100 miliaria sections. The five diagrams indicate the scale bar measurements in Roman Miles for the various sections of the chart and its rather wild variations of measurement. A study of the previous five diagrams has been encapsulated in this single diagram illustrating the problems encountered whilst analysing the distance measures. 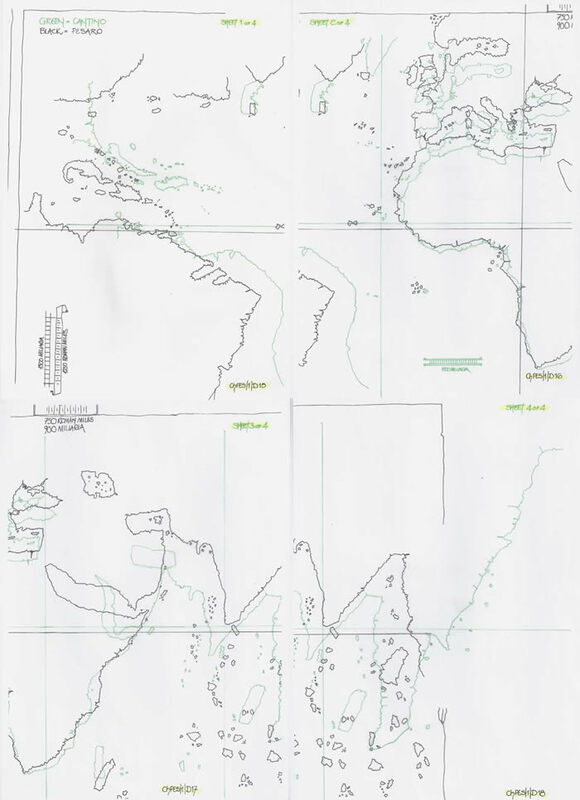 The western section varies from correct longitudes at the Equator and positions Cuba, 85W from the eastern cape of South America, 35W, but within that the whole West Indies actually from 60W to 85W is expanded by 125%. The latitudes from 17S to 10N are expanded by 143%, of normal 75 Roman Mile distance. Europe is drawn reasonably correctly with latitudes of 75 Roman Miles and longitudes of 60 Roman Miles, emulating the Ptolemaic ratio. 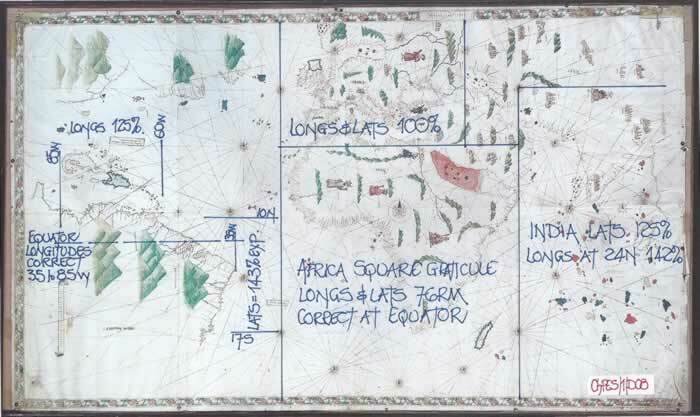 Africa has been drawn correct based on the equatorial standard with latitudes and longitudes agreeing at 76RM (75), but by extending the continent to 35S with the same Latitude/longitude measures the draughtsman has introduced a square graticule for Africa. The Indian sub-continent has a latitudinal expansion of 125%, and, a longitudinal expansion measured across the R. Indus to R. Ganges, a basic 24 degrees, of 142%. Thus none of these expansions represent the change from Ptolemaic 500 Stades to the correct 600 stades and must be seen as copying sketches of probably unknown measurements. 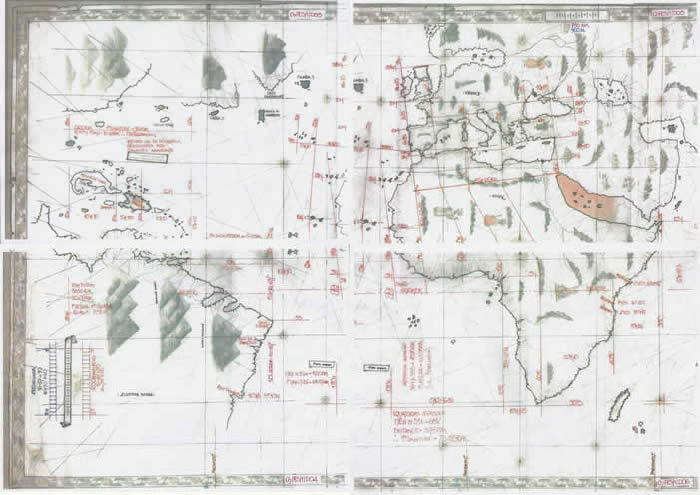 Some of the major charts/planispheres preceding the Pesaro Chart are, LaCosa1500AD, Cantino1502AD, Caverio1506AD and Fano1508AD, which are all illustrated to show their West Indies section above South America. If the longitudinal measurements as taken from the charts scale bars are studied, then it will be observed they are wildly exaggerated in terms of Miliaria measurements to the geographical actuality. On the Pesaro Chart the 37/43N problem of substitution, 75 Roman Miles but 75 on a Miliaria scale bar, have been reverse translated and drawn as Roman Miles; hence the rather over large West Indies section drawn on this chart could be attributable to the mis-measure, but as it occurs on the other charts it is obviously the original sketch of unknown measures. That raises the spectre of the draughtsman not understanding the various measurements being dealt with and assuming all “Miles” were “Miles” because the name was the same when in fact they vary considerably. However later facts may influence this comment! 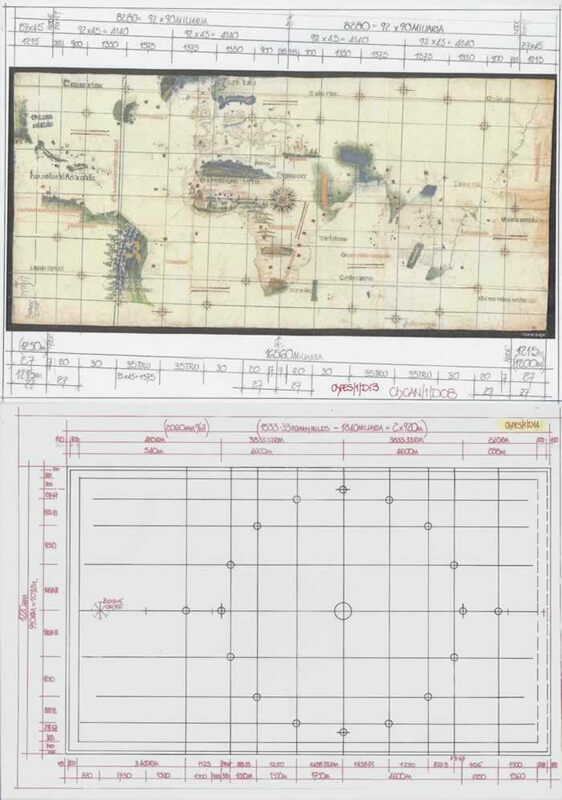 Therefore the Pesaro chart, beautifully presented as it is would seriously confuse navigators and thus the comments made that “The Pesaro Map is a working navigational chart, not an artistic copy made for some Prince”, is well wide of accurate, plainly wrong. This discussion commences by using the setting out found on the Cantino1502AD chart (Diagram ChPES/1/D13) where the draughtsman had understood the instructions that can be gleaned from the Atlas page of Petrus Vesconte on which he clearly sets out the methodology of constructing a wind rose using 92 sub-divisions of the radius. The Cantino1502 chart is set out as 8280 or 92 x 90 miliaria per wind rose diameter. This provides for an elegant and simple mathematical wind rose construction as the diagram ChPES/1/D13 illustrates. But the draughtsman of the Pesaro chart has gone one stage further by simplifying the setting out as diagram ChPES/1/D14 clearly indicates. The wind rose diameter measured via the scale bar is 7666.66 Roman Miles which simply converts to 9200 miliaria and hence the radius division of 35/30/20/7 units is simply 1750/1500/1000/350 miliaria totalling 4600 miliaria radius. This is the simplest and most elegant method to construct a wind rose graticule, and follows the Atlas instructions given by Petrus Vesconte to the letter. But, it raises the question of why is the scale bar Roman Miles, and the actual chart sections totally awry in their individual scales, when the draughtsman obviously knew the miliaria measurement, or its conversion factor to use on the wind rose setting out. Can it be that the missing western bordure contained the miliaria scale bar as well as the attribution and date normally appended to Portolan Charts, but as we have seen is missing from some of the planispheres? For those who find this section difficult to comprehend mathematically, as it is geometrically based, there are two co-joined papers on this website, texts ChWR/1 & ChWR/2, fully explaining the Atlas Page by Petrus Vesconte and his scale bar usage. I have chosen to compare the Pesaro chart to Cantino1502AD, Caverio1506AD and Fano1508AD whose scale bars have been equalized. Each chart is simply overlaid on the other in outline format using the southern tip of Africa as the alignment point for no other reason than it closely resembles the centre of these charts and thus there is no manipulation involved which I consider playing, not research. The diagrams co-join to form one chart. As the four diagrams illustrate there is little that may be considered similar and hence they cannot be copies or based on each other and therefore it is not necessary to write text just to confirm that fact. Look closely at the diagrams and it will be seen they cannot agree. 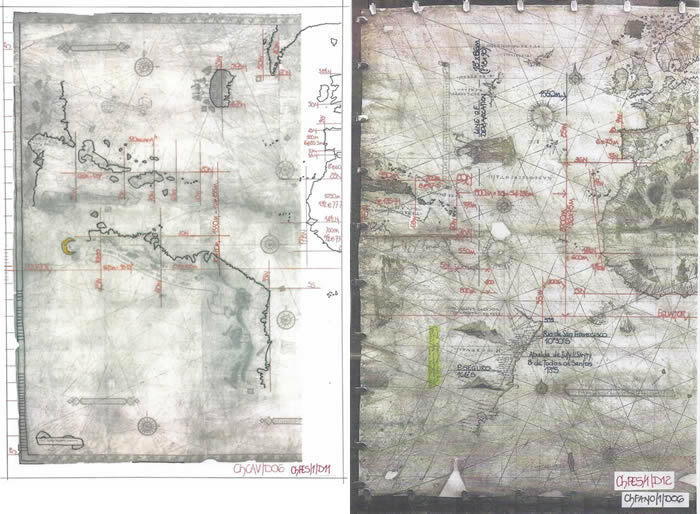 The western section is totally different and thus the two charts do not represent a similar base form as diagram ChPES/1/D19 clearly indicates. 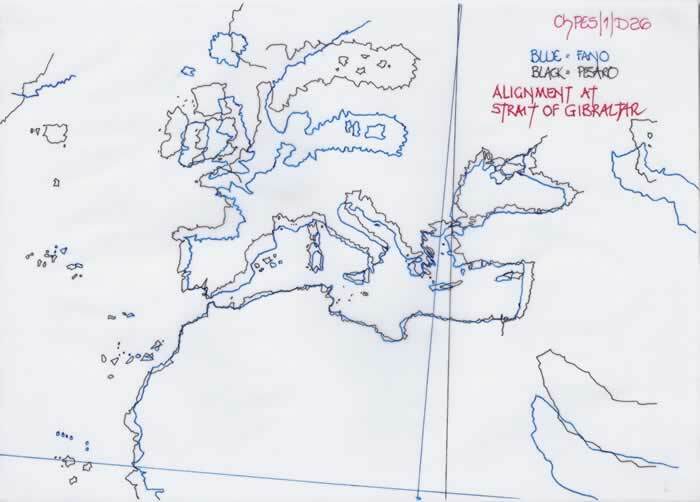 However as Diagram ChPES/1/D20 indicates Europe and Africa are similar although the African continent is a far better match than the European section which has been shown in text ChCAV/1, the Caverio chart, to be very poorly drawn. Diagrams ChPES/1/D20 & D21 indicate a similarity in the drawing of the Persian Gulf (Ptolemaic version) and the Indian sub-continent, which probably stems from the two being copied from a similar chart and thus are the closest to being possibly the same family of charts. But this type of comparison whilst visually appealing is normally wrong in fact as the Geography of Claudius Ptolemy was by now widely available to be freely copied. Any similarity in the western section is hard to determine given that the Fano chart has been reduced in length as text ChFANO/1 illustrates. The central section of Europe/Africa is very similar to the Caverio plot overlay in accuracy for the African continent but totally awry for the European section. The Indian sub-continent on the Fano chart is far to the south of the Pesaro plot and unfortunately curtailed by the reduction of the Fano chart in length. But note the twist to the Fano chart’s Indian peninsula! As the Fano chart is noted there-on as being drawn by Vesconte Maggiolo and many researchers have commented regarding the similarity of Pesaro to Fano, this simple overlaid plot of the European section clearly indicates a divergence in their origination. If both charts were by Vesconte Maggiolo or the clan, it is to be expected they would use the same base model/template for Europe and hence there should be a much greater alignment and coastline agreement. It does not happen and thus the conclusion must be that they are not by the same draughtsman, or his atelier. If the Pesaro chart were a Maggiolo chart in disguise then it is perhaps logical that the charts would exhibit a goodly degree of drawn profile agreement in their setting out in order that the basic templates could be used to facilitate the easy construction of their charts. Thus Diagram ChPES/1/D27 is the plain chart held in the Houghton Library, MS Ital 144. But Diagram ChPES/1/D28 Illustrates the setting out of the wind rose graticule as drawn on the 1513 chart which was produced in Naples. The fact is that the logic of the 92 unit wind rose has been totally ignored in favour of a pure measurement based wind rose with a single Roman Pes of 16 Digitus being used to set out the graticule. These two charts are thus not to be considered as by one person, or an atelier, but this chart may be considered reminiscent of many preceding charts decorated similarly, and it exhibits far greater stylistic features than the Pesaro Chart which is simplicity itself. Nothing in this research points to the Pesaro chart being either by or copied actually from one of the tested charts by reason of their divergence in so many areas. Similarities can be perhaps made visually but when the actual charts are overlaid they become less obvious and thus cannot be considered as brother or sister charts. They all indicate a wide variation in the draughtsmanship and their accuracy which would not be correct for a single author. Like many other charts which are unattributed there-on perhaps always seeking the author is fun but eventually a waste of time unless careful analysis of each can be carried out with the two originals side by side, thus exact comparisons of style etc can be made. The stylistic simplicity of the Pesaro Chart illustrates the fact that this chart is to be considered “geographical” and not a decorated library piece. It is also open to opine that it is not the finished article the draughtsman desired as at this period there was far more information available in the east which could have enhanced the “geography”. The western part is intriguing and would point to a failure by the draughtsman to update his information sufficiently, which could point to a chart being drawn over many years, perhaps 1504 to 1508 and what had been drawn remained unaltered. Thus I suggest that the large amount of mountainous area drawn is probably a fig leaf for this continuous drawing process as it was impractical to alter the drawn sections to update it all but some stylistic forms were drawn. ChCAN/1 & ChCAV/1 ( includes ChCAN/2 & ChCAV/2); Cantino1502 & Caverio. ChFANO/1 = Vesconte Maggiolo chart as named and dated! 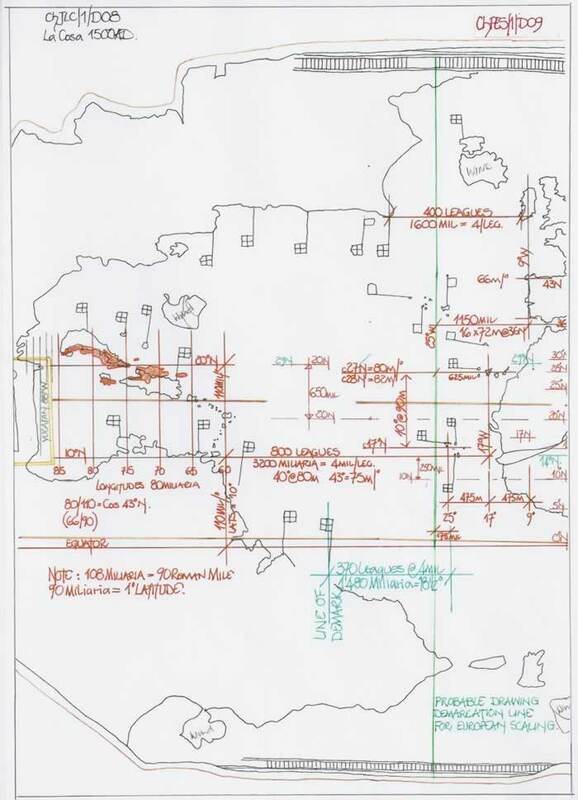 2) The Mapping of the Entradas into the Greater South West. Spanish Entrada Cartography P79; Dennis Reinhartz & Gerald D Saxon 1988. (7) The King-Hamy portulano (HM45) at the Houghton library has been attributed to Amerigo Vespucci; see Giraldi, Amerigo Vespucci, pl10. Puente y Olea, trabajos geographicos, 276, 302/3, says the map is the work of Nuno Garcia de Toreno. 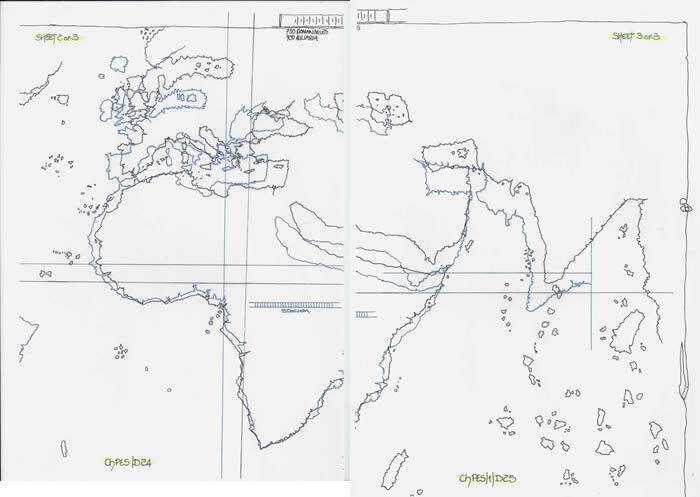 Margaret S Dilke and A Brancati show that recent research makes it difficult to accept any definite conclusion about the map; see their article, The New World in the Pesaro map, Imago Mundi 40 (1988) 78-83. 3) Imago Mundi, a review of early cartography, edited by Leo Bagrow, EJ Brill Leiden. The Pesaro map has not even framed the concept of a continuous mainland from Greenland to Patagonia; it lacks the hand of Cosa. It shows 3 separate lands corresponding with Greenland, Newfoundland/Labrador and an indeterminate land far to the west, with a hypothetic coastline. The Pesaro map lacks all the major features which enrich the Egerton MS2803 map and clearly cannot be the Padron Real from 1508 onwards. 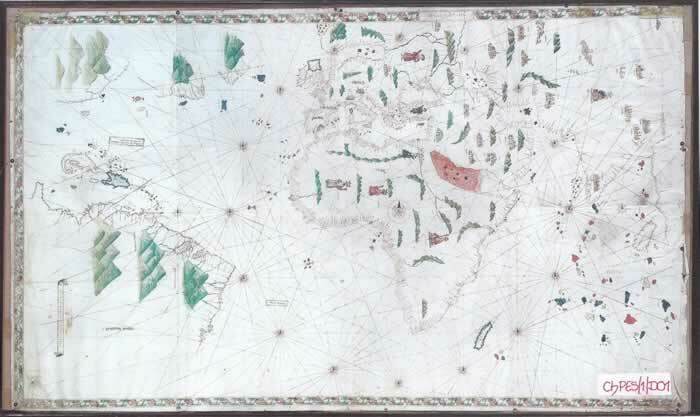 It may be based upon Vespucci’s voyages, as Stevenson suggested, but the Egerton Map, a map of the New World, stands as the most probable example of the Padron Real of 1510 that exists. 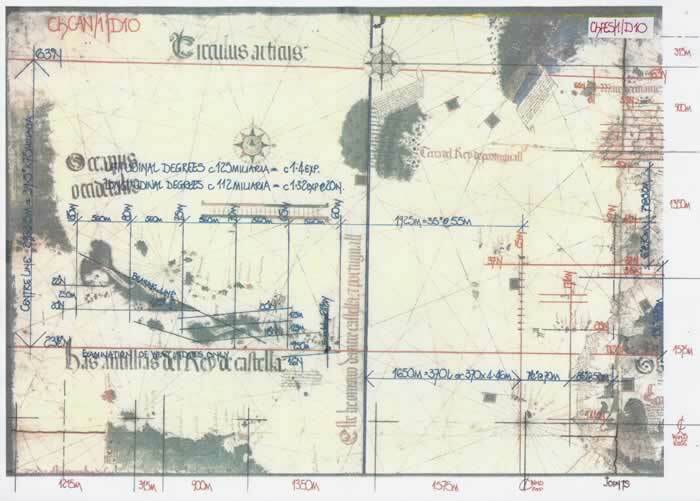 The map of Juan de La Cosa of 1500 was too early for precision or much information or nomenclature. M J Ferrar August 2018.